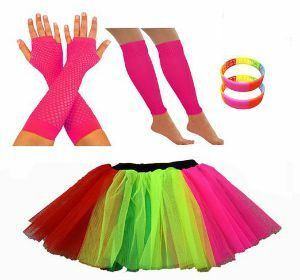 For this post I'm going to show you how to quickly put together a no-fuss 80s costume using low-cost accessories at Amazon in the U.S. and UK. 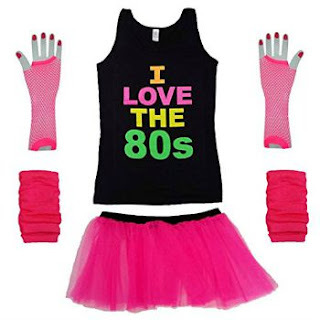 You could make life really easy by simply purchasing the costume above (US only) which includes a choice of three brightly-coloured skirts and an "I Loveheart the 80's" black tee. However, although convenient, ready-made costumes tend to be more expensive than buying each item separately. 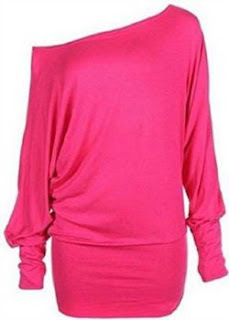 80s Shirts and Skirts in the U.S.
You can get an authentic eighties look by using an off-shoulder loose and over-sized top, preferably with batwing sleeves. I would recommend ordering a larger size than normal to get that loose feel. You will also find many very competitively-priced 80s Tees on ebay where all the top suppliers are selling their wares these days. There are dozens more 80s T-shirt ideas on our website, too. So what about the skirts? Layered, neon skirts are always a popular choice or you could go for a longer length, black skirt for a Madonna look. To create a workout/fitness look use leggings instead of a skirt and add leg warmers and scrunch them up around the ankles. This "LOVE" tee is a popular choice through our website SimplyEighties.com and was priced at just £8.99 as I write. This Flashdance style top is available in a wide range of colours and I recommend choosing dark grey or black for an authentic look. All you need to add are some black leggings and leg warmers and you have a complete Flashdance look. The pink and turquoise colours are also ideal for creating a more neon style. This is a very popular tee which is available for sizes from 8 to 14. I recommend ordering a larger size than normal, as feedback from customers who have bought the tee from Amazon links on our website Simplyeighties.com have suggested that it runs small. Here we have an instant costume kit for ladies which includes all you need for a fun night out. It's available in five colours and five size choices from 8 to 18. 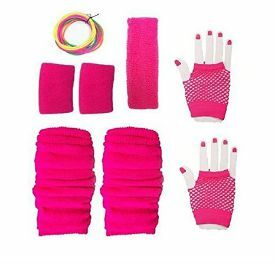 This accessory kit is perfect for adding to a shirt and skirt costumes and includes leg warmers, fishnet gloves, wrist and head sweatbands and neon gummy bangles. This kit is ideal for creating a fun and colourful style and all you need to add to it is your top. It's also perfect for fun runs and hen nights. For many more ideas visit the 80s T-shirts and 80s Skirts pages at our website Simplyeighties.com. By the way, if you're reading this in the U.S. (around 50% of you will be if the Google stats are correct) then you'll be pleased to know that all of the items featured on this page can be bought at Amazon, too. Pac-Man, of course, is one of the most recognised and loveable video game characters from the 1980s. When it was released into the arcades by Namco in 1980, the game took the World by storm and became one of the most highest-grossing video games of all time. The first dress (above) features the highly-recognisable video game screen and is available at one of the UK's longest-running and most trustworthy fancy dress companies, Angels. At £10.99 (as I write) it's very decently priced and is available as "one size fits most" which is for 8 to 12. It's certainly eye-catching and ideal for 1980s and video game events and parties. As you can see, dresses featuring Inky, Blinky, Pinky and Clyde are also available and these dresses would be perfect for group dress-up, hen nights, Halloween etc. 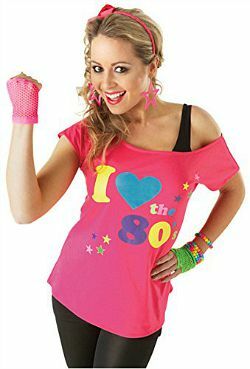 You can see many more 70s and 80s fancy dress ideas at our website. 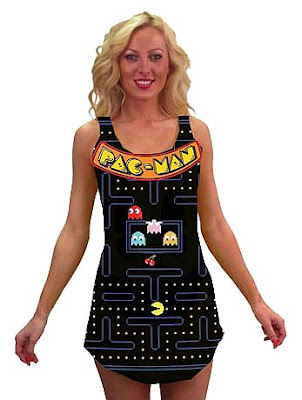 You may also like the post Pac-Man Dress-Up Costumes for Men ans Women on this blog. This dress may also be available at a lower price on ebay.